In this Nov. 28, 2017, file photo, Sen. Jeff Merkley, D-Ore., speaks at a rally in Washington. Merkley, while trying to gain access to a federal facility housing immigrant children in Texas near the Mexico border and talk to a supervisor was turned away after police were summoned. Merkley was in the Rio Grande Valley on Sunday to “check in” on the new policy, which the Trump Administration announced earlier this spring to prosecute adults illegally crossing the United States-Mexico border and in doing so, separating any parents from their children. This practice did not take place before spring. Now, undocumented adults apprehended in the Valley are being taken to federal court in McAllen or Brownsville, where a magistrate judge issues sentences. Meanwhile, children are being sent to U.S. Department of Health and Human Services facilities in the region, or shipped to other facilities hundreds of miles away. “Senator Merkley is irresponsibly spreading blatant lies about routine immigration enforcement while smearing hardworking, dedicated law enforcement officials at ICE and CBP,” White House Deputy Press Secretary Hogan Gidley said in a statement Monday. “He voted against closing the ‘catch-and-release’ loopholes used by child smugglers, and his reckless open border policies are responsible for the permanent separation of thousands of American families who have been forced to bury their loved ones. On Sunday, Customs and Border Protection gave Merkley a tour of its processing facility in McAllen before the third-term senator visited the Catholic Charities-operated Humanitarian Respite Center in downtown McAllen. He then attempted to tour the Southwest Key Programs detention center in the former Walmart on Padre Island Highway in Brownsville, where local police were called and he was asked to leave the private property shortly afterwards. That property the old Walmart sits on is contracted from the Office of Refugee Resettlement, an office within HHS. All windows and doors were blacked out, and the parking lot had warnings to not enter. Before Merkley made his way to the front doors, he introduced the facility on Facebook Live, where he documented the entire experience. Merkley said Monday there are reportedly 1,000 children in the old Walmart building. 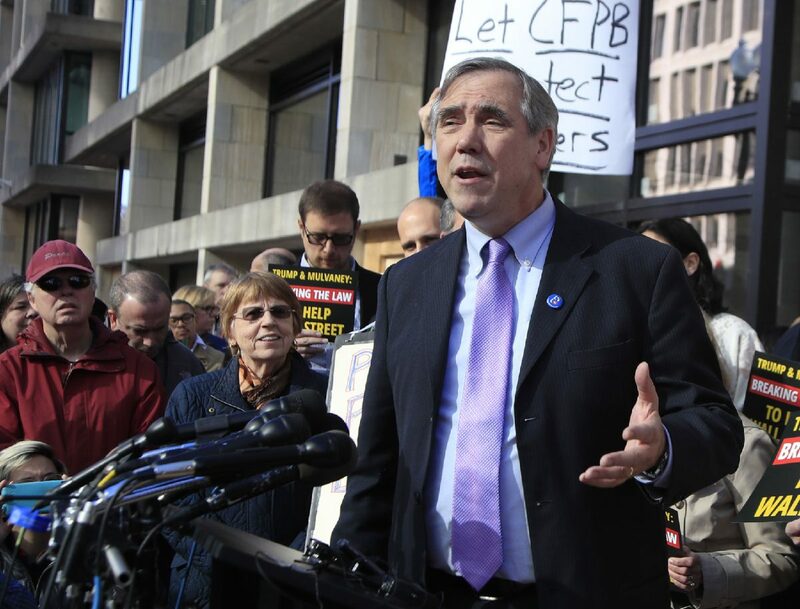 The scene unfolded quickly, as Merkley, his team and a small contingent of the news media followed him to the front doors, where a telephone number was listed. Merkley called and soon after requested to speak with a supervisor. Police arrived shortly after to take down his information, and the supervisor exited the building only to tell Merkley to call a Washington, D.C. telephone number. Merkley asked the supervisor and police officers several questions about zero tolerance before the supervisor eventually asked Merkley to leave. Merkley did not appear skittish nor hostile in the interactions. Seifert was not with Merkley when the senator took his 1-hour tour of the McAllen processing center, which is often closed to members of the public and news media. Merkley described seeing distressed people, and some crying. He also recalled seeing a large group of boys lining up for food in order of height. Merkley and Seifert both recalled meeting a pregnant woman from Central America at the respite center. Merkley asked why she came to the U.S.